A cycle is a non-empty move sequence that starts and ends with the same position. this may also be called a positional cycle to avoid misunderstandings. If at the end of the cycle it is the same player’s turn as at the start, it is also a situational cycle (repeats the same situation). If cycles are allowed without restrictions, it is possible for a game to go on indefinitely. Although it is easy to play cycles if both players cooperate in creating them, such cycles are uninteresting, because it will be to the benefit of one of the players to break the cycle and play elsewhere. Of more interest are cycles that can be forced by one player: allowing such cycles could enable a player who is behind to prevent a loss by forcing the game to continue indefinitely. Most such cycles are rare, and the only one that is seen regularly in actual play is the basic ko. If multiple cycles occur on the board simultaneously, they may interact and combine to form a longer cycle, as in triple ko. For more details, see the article Superko. All rule sets prohibit repeating the position in a basic ko, and the Chinese superko rule also forbids repetitions by means of sending two, returning one, but not all rule sets all prohibit longer cycles, such as triple ko, eternal life or round-robin ko. This is probably because they are so rare that they were never considered. 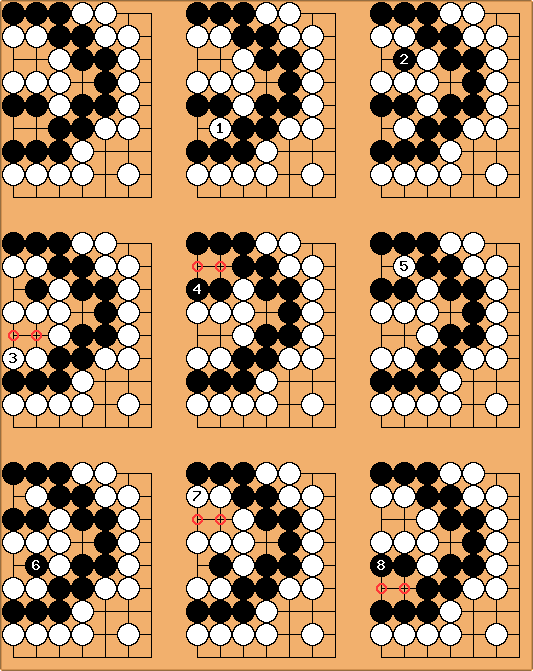 In rule sets that allow them, a game in which they occur is usually declared "no result", which is sometimes ruled as jigo (tie), and sometimes replayed. Rule sets that do forbid longer cycles usually do so with one of the superko rules (or an equivalent formulation): positional superko, situational superko and natural situational superko, respectively forbidding positional cycles, situational cycles and positional cycles where the player completing the cycle originally created the position. We can classify cycles by the number of moves that are played before the position repeats. Shorter cycles are more common than longer cycles, and cycles with an even number of moves are far more common than those with an odd number of moves. The 1-board-move cycle is mainly a theoretical construct, as it is illegal in most rule sets. A single-stone suicide is the only possible type of one-move cycle apart from a pass. It is only legal in rule sets that allow suicide and do not use positional superko; even then the only possible point of it is to pass without allowing one’s opponent to end the game immediately. It costs one point under territory but not area scoring and loses sente. Two successive passes form a 2-move situational cycle, if “move” in the definition is taken to mean turn rather than board play. If we allow multiple moves by one player, another possibility is suicide of two stones. 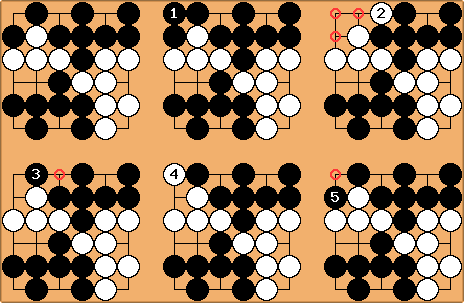 This is the only possible type of two-board-move cycle, since the second stone must capture the first in order to recreate the original position. The sending two, returning one sequence is an example of a three-move cycle. Under territory scoring rules, this sequence constitutes a loss for White, as she has give two prisoners to Black’s one. Under area scoring, it does not constitute such a loss, but still loses sente. If positional superko is used, is prohibited. This is intentional, but not ideal: in exceptional circumstances, positional (as well as situational) superko can lead to counter-intuitive results. See Rules Beast 1 for a case where both superko rules surprisingly force a connection in a seki to avoid a capture; RP’s Cycle Completion proposes a remedy. 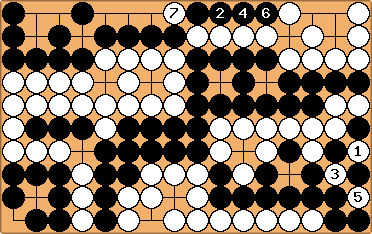 Under rules that use area scoring without banning long cycles, this pattern would allow White to force an endless game unless Black can afford a local loss (in the above case, by ignoring and allowing White to capture, turning the seki into a live white group and losing Black 6 points). Under territory scoring rules, this is not the case, as each repetition of the cycle gains Black one point. Black can play through the cycle a few times until he has gained enough to compensate for the local loss. The sequence known as eternal life constitutes a four-move cycle. If either positional or situational superko is used, is prohibited in the above sequence. Under basic ko rules, this cycle could repeat indefinitely. This sequence, known as sending three, returning two, shows a five-move cycle. As with all cycles that have an odd number of moves, this sequence loses sente. Unlike the sending two, returning one scenario however, is mandatory for Black as the only way to avoid losing his group. Under positional superko rules, is prohibited. This basic triple ko example shows a six-move cycle (actually a combination of three 2-move cycles). Under superko rules, is prohibited. Eternal ko is also a six-move cycle. This “round robin ko” constitutes an eight-move cycle. 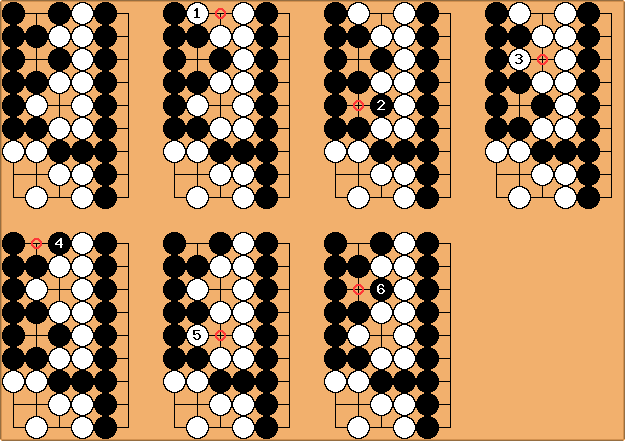 The quadruple ko is also an eight-move cycle; molasses ko also yields an eight-move cycle, if repeated moves by both player are allowed. The triple ko stones cycle (not the same as triple ko) constitutes a ten-move cycle. Mentioned at http://home.snafu.de/jasiek/ko.pdf. Shimada’s ko also constitutes a ten-move cycle. Mentioned at http://www.britgo.org/rules/molasses.html and http://harryfearnley.com/go/shimada/intro.html. Round robin ko (an eight-move cycle) and Molasses ko (an eight-move sequence, but not a cycle in itself) can both be made into ten-move cycles by combining them with basic kos. This quadruple ko stones cycle (not the same as quadruple ko) is a fourteen-move cycle. It was discovered by Matti Siivola. Mentioned at http://home.snafu.de/jasiek/ko.pdf. The standard definition of an abstract game forbids all forms of repetition. Games allowing repetition are known as “loopy” games. For go, we need to consider sums of loopy games in which repetitions are forbidden in the sum (though not in the summands); the precise form of this prohibition depends on the rule set we are analysing. When considering a sum of games we allow successive moves by the same player in one summand (with intervening moves elsewhere by another). The definition of “cycle” above tacitly assumes that play within one cycle alternates between the two players, as it does in almost all the examples below. When repeated plays by one player are allowed, suicide of n stones in an n-point space is an n-move cycle. Cycle Law — In a situational cycle the difference in the number of passes is the negative difference of removed stones. Directed Acyclic Graph — A mathematical construct sometimes used to detect cycles and transpositions. Superko — The various concepts and proposals used in rules to prevent indefinite play by forbidding cycles. Stoical Go — A Go variant where ko and superko rules are replaced with a simpler rule rendering all known forced cycles impossible. Pinwheel Ko — An infinitely scalable cyclic pattern. : Robert Pauli disagrees, maintaining that all cycles are of even length and may include passes. He proposed to replace this page with the one at Cycle / Alternative definition by Robert Pauli. This proposal received no support, and was contested by Herman Hiddema, Robert Jasiek, Bill and fractic. Please keep any discussion here short; longer and older discussions can be found at /Discussion. A move can be a board play or a pass, however, the cycle length only counts the board plays and every cycle at least has to use one. This is my best guess. Should it be wrong, I humbly ask for a correction. fractic: Robert, you keep insisting on a single unifying definition. The definition you gave above is perfectly workable if you are writing something that requires a very precise definition. But that is not what this page is. It describes the term generally not specifically (PJTraill did a great job highlighting this with his latest edit). And as a result the definition is somewhat ambiguous. But this is a good thing, it makes the page inclusive of different uses of the term. So since you ask for a correction, I shall try. There is nothing wrong with the meaning of your definition. The error is in that that definition is suitable for a mathematical paper, not a general wiki page.